Of all the places for a horse to find himself alone, a sand-grinding pit on the edge of the Colombian jungle may rank among the most terrifying. 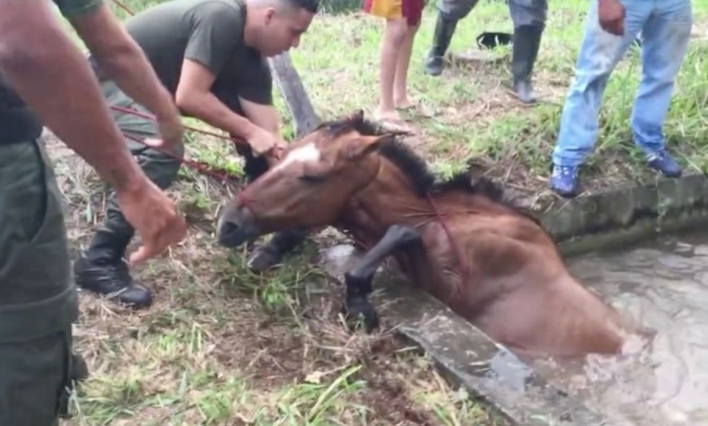 Somehow, this horse managed to fall into a ditch, where sand is made from water and ground stones — a sinking death trap for anyone caught inside. And of all the people to come to his rescue? A machine-gun-toting detachment of Colombia's finest. The officers were called to the rural town of Dagua in the Valle del Cauca region earlier this month, after the horse had fallen into these treacherous waters. A video, posted to the Facebook page for Colombia's National Police Service, details the spectacular rescue effort. Pulling the panicked horse out proved harrowing, as the animal bucked and thrashed. Attaching ropes to the beleaguered horse, officers attempted to haul him out of the murky water. But it wasn't until a brave boy leapt into the water and pushed the horse from behind that they made any progress. En el marco de la ejecución del sistema integral de seguridad rural, y gracias a un oportuno llamado de auxilio, logramos evitar que este juguetón amigo perdiera su vida en una trituradora de arena del municipio de Dagua en el Valle del Cauca. Responses to " Horse Who Fell Into Deadly Pit Gets Rescued In Nick Of Time"